With spring weather comes more time outside, leading to an overall better feeling me. I've been attending my local CrossFit box since January, and that along with chiropractic care has seemed to be the best fit for helping my chronic back pain. Physically and mentally, things have been going quite well, but I'm seeking a way to not back-track. This article regarding a g-free lifestyle was recently shared with me, and I really appreciate the validation it offers for some of the problems I've dealt with. (TL;DR- wheat and dairy products potentially influence a person's susceptibility to psychological issues, including depression and anxiety). Over the last 8-10 months, I've been experimenting with the gluten free lifestyle, limiting bread and pasta and all other gluten-y goodness. My original reason for cutting gluten was related to my back pain. However, it only went as far as I would let it. Confession: my mom is a baker, and her bread is hard to resist. Most "falls" I had in the first few months were at my parents' house. I lost a few pounds, felt better about myself, but didn't notice any improvement in my pain level. With lack of improvement, there was lack of interest. I started to eat pasta again. Bread was in my house anyway, so I ate it if I wanted. Also, beer. Enough said. However, even after 6+ months of care with a therapist and some improvement, I'm now seeking alternatives to therapy and medication. The added benefit of losing some of my back pain would also be nice. At this point, I don't know how dedicated I will be to the cause of no gluten. Both my husband and son eat gluten foods, so they are always in the house. But gradually changing may be better for me. My newest test is pictured above. 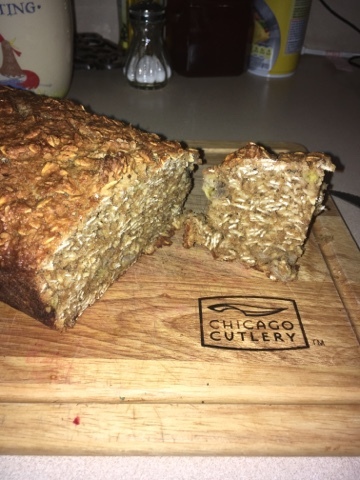 An oat-y banana bread that is delicious even if you aren't g-free. I don't always have really ripe bananas for bread, but my husband suggested it, so I have a great filling snack all week at work! Win-Win! I love the remnant fabric bin at my local Joann's store. Something about the potential, the color, but also the limits. Most days, it's a bust. But every once in a while, I find something good. A few months ago, I scored some brand name camouflage fleece and a nice green fleece. 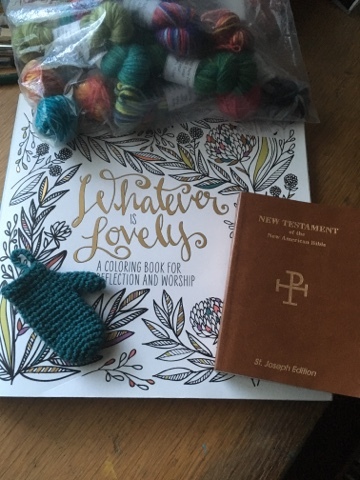 Thinking they'd make a great 'something' for my husband, and considering the 50% off fleece sale (in addition to the remnant sale price), I bought both pieces. Sidebar: I am totally useless at math. Totally. Meaning, I usually end up with way less or way more fabric than I need (or yarn... or whatever) for the project I want to make. The aforementioned fleece sat in my craft room for a while. I dutifully washed it, laid it out as a measurement of sorts, realized I needed more, and folded it up and put it away. This past week, I had my spring break. One of the wonderful perks of being a teacher. Also, a prime time to work on projects. With the happy toddler in tow, I headed out to the craft store for some yarn to finish a project. I had a great coupon (of course), and knew exactly what I wanted. Just a few skeins of yarn, nothing else. That nothing else turned into more green fleece (50% off again) and 2 cuts of fabric for dresses for me. Whoops. However, I now had my husband's Easter gift. 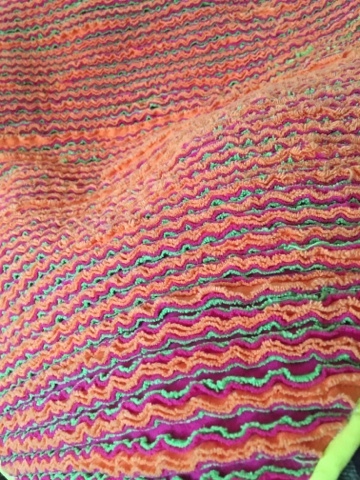 Another round of washing and drying, lots of "help" from my toddler, and an hour later, I had a fleece tie blanket. 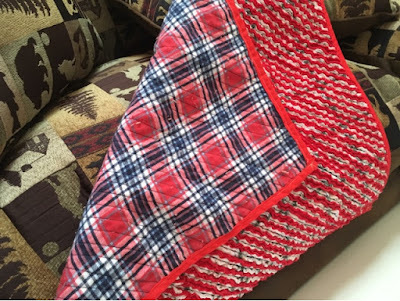 Those that sew may tell me (and you) that I easily could've made do with the fabric I had. Probably true. However, with my nearly sub-par sewing skills (mostly straight lines, honestly), tying was the best way to go for me. 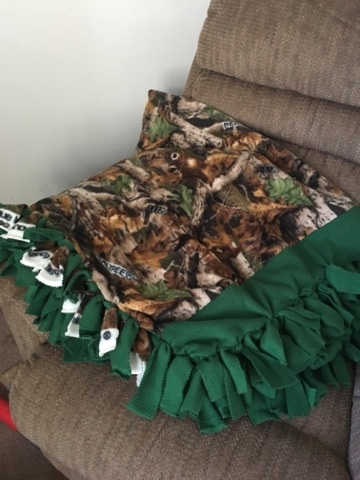 I split my initial piece of green fleece, used it to border the camo, and then did endless knotting. Again, not the most economical, but definitely a labor of love. 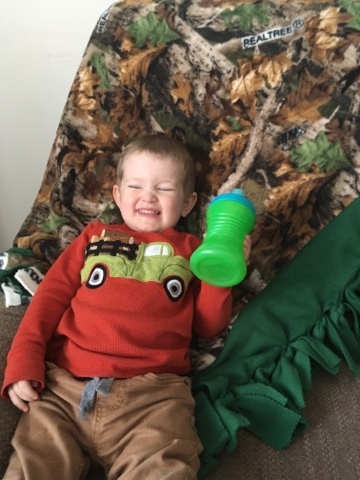 Another lesson on measure twice and cutting once-- I have those nearly every time I sew (whoops)-- and more ideas on entertaining the toddler without digital entertainment so I can work. 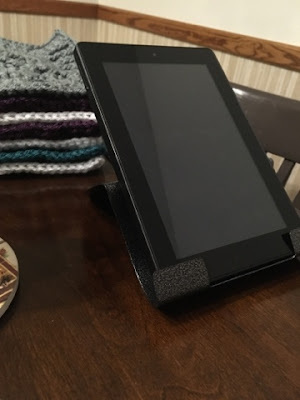 I recently had an argument with a 14 yr-old at middle school youth group (helping out this year, probably in charge next) about the pros and cons of a Kindle e-reader. First, I'll confess that I don't actually have just an e-reader. I bought a Fire 2 years ago to save myself the agony of not having printed patterns for all of my crochet projects. Definitely saving on paper in that department. However, our local library system also uses the Overdrive app, compatible with Android devices. So, I have access to a huge library of resources, without ever leaving my home. It has saved me numerous library fines, and lots of stress. This student at youth group, however, was trying to convince me that printed books are better. Hilarity ensued as we went back and forth on the benefits of printed books vs the benefits of e-readers. I tried to convince her that having a digital book can be convenient if you are going out of town and want to bring 5 books with you-- instead of five printed books, all you need is one e-reader. She would not budge. "The smell of books..."
I have to say, I don't disagree. The first thing my husband and I unpacked in our house 2 years ago was our vast collection of books. In fact, a huge selling point for us was the built-in bookshelves in our basement. When in college, I sought out first editions of the Harry Potter series. We own several copies of the Lord of the Rings trilogy. However, I am a full time, working adult, who also happens to be a wife and mother. Library visits don't happen very often (yet). My personal library is not always what interests me. Some days, I need a new work of fiction that I can read in a few nights and feel pleasant about afterward. My Kindle, and the library's online/digital presence, has helped me read again. I'm pretty sure I read one new book my first year of marriage. Coming from a woman who read new books every week, this was a huge change. As I continue to deal with anxiety and depression, I've realized that new knowledge is key to help me distract myself. Since the beginning of this school year, I have read at least 7 new books, which is roughly one a month. You won't find me arguing the allure of a printed book. This past October, I bought 2 new theological books to read, devouring one almost immediately. Old books are one of the things I hate to purge (although cleaning is necessary) and I love used book sales. But sometimes, a busy life needs convenience, and Kindle gives that to me. It starts with this great image. Simple for those just starting, but still engaging. I've been using both markers- Papermate Flair or Crayola- and colored pencils, which gives me a wide range of color and texture for my coloring. The paper quality of this book is great, and works well with markers, something that can sometimes be hard to find with all the coloring books that have been released over the past year or so. 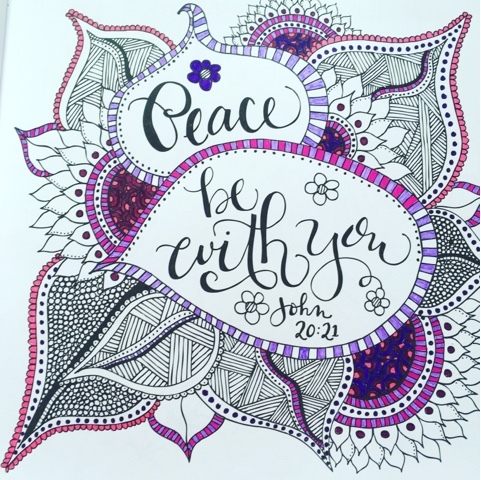 My favorite colors, and a great reminder! I would highly recommend this book, especially if you are into adult coloring books. 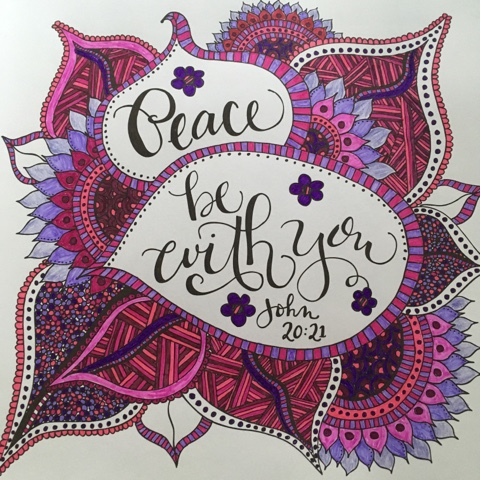 Meditating on one Scripture passage or something equally inspiration while coloring is very soothing. My sister in law is a great inspiration for me. She lives on a farm with her five kids, husband working for the local school and their church. 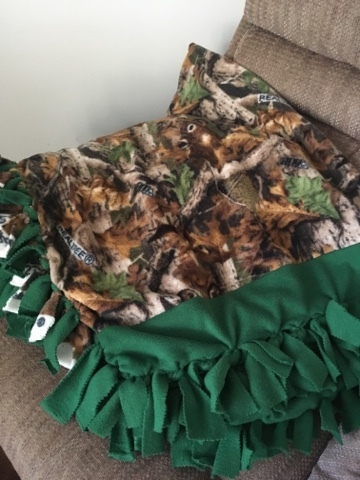 Recently she started selling faux-chenille blankets, inspiring me to try making one of my own. 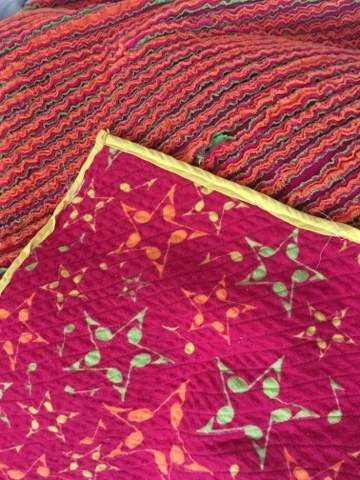 But with the habit that is buying fabric, I ended up with two! One pink/orange/yellow/green, the other red/white/navy. This is much brighter in person. I have many improvements to my own sewing that need to happen, but practice makes perfect. 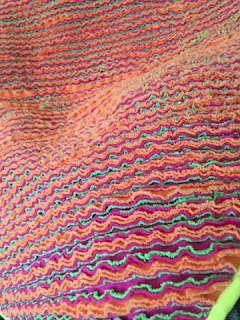 Already, I am working on a third blanket, and hope to have it done sometime in the new year. For all you people complaining that school starts in three weeks, take note. My professional development starts this coming Monday. As I reflect on my lack of productivity this summer, I realize that I have had a decent amount of time to relax, which has been good. I have also been knitting some mitered squares for a sock blanket, and will intersperse with crocheted mitten ornaments to break the monotony. 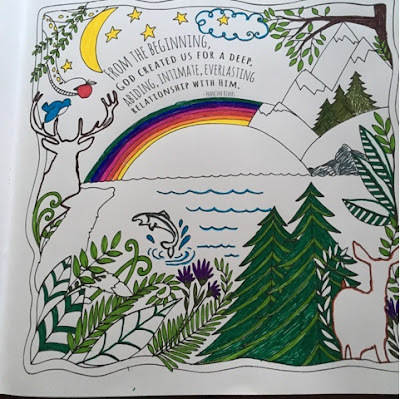 Is an overly detailed coloring book for you? My answer is yes. I've been working on the above image for about a week now, and I love it. Neither of the two previous pages were finished, but I needed the message of this page. 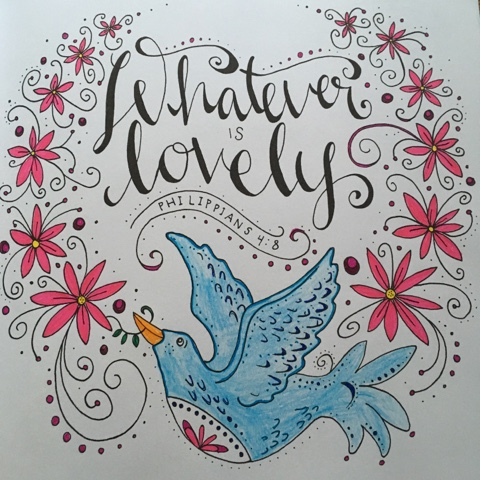 My book of choice is 'Whatever is Lovely: a coloring book for reflection and worship'. It has proven to be just that. Using this book with my daily prayer time helps me to relax a bit and refocus. Peace has been my word for the last two weeks. 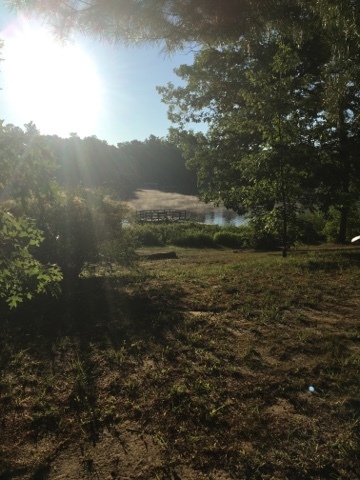 First I was at camp, and now I am preparing for a new school year. Peace is definitely what I need.